Indy Stair Lifts, part of Nationwide Lifts, provides independence to anyone who has trouble climbing stairs. We offer a variety of stair seat lift systems that range in size and style to accommodate any kind of staircase and perfectly match your needs. 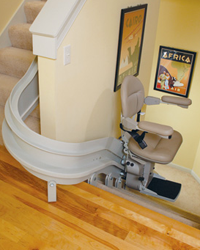 The Indy Pinnacle is the narrowest stair seat lift on the market, extending only 11 inches from the wall. It’s ideal for the narrow staircases that are common in older homes. It’s the most affordable and compact option and comes with safety sensors that stop the lift when it meets an obstruction. The Indy Lux stair seat lift conforms to any body type with multiple seat heights, a large seat size and adjustable width armrests. It is extremely durable, with a 400 pound weight capacity that accommodates any body size. If you have a curved staircase, the Indy Curve stair seat lift is ideal. It will fit the exact specifications of your stairway and can reach around every corner. It features a custom-built rail to match the contour of your staircase, adjustable seat height and armrests with a swivel seat that has a width of 21.5 inches to accommodate a range of body types. These are just a few of Indy’s acclaimed stair seat lift models that come with a 10 year warrantee and 24/7 on call support to help you with any issues that may arise. We also offer discounts for veterans, used stair lifts and a rental program that provides savings on our top of the line stair seat lifts. We’re committed to servicing our customers and providing them with the independence they desire to move freely around the house. Our stair seat lifts make your home more accessible and are ideal for anyone who has trouble climbing stairs. Please call us at 1-888-203-5754 for more information on Indy Stair Lifts.